Goodreads Summary: Born in an Andean village in Ecuador, Virginia lives with her large family in a small, earthen-walled dwelling. In her village of indígenas, it is not uncommon to work in the fields all day, even as a child, or to be called a longa tonta—stupid Indian—by members of the ruling class of mestizos, or Spanish descendants. When seven-year-old Virginia is taken from her village to be a servant to a mestizo couple, she has no idea what the future holds. 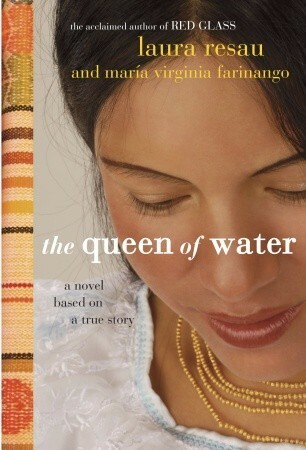 What I Think: The Queen of Water reminds me of Sold by Patricia McCormick. It is one of those books that you begin reading and you hope that it takes place a hundred years ago, but then throughout the book, you begin to realize that it only took place a decade or two ago. Virginia is an indigenous girl living with her family in a small village in Ecuador. When she is only about 5 or 6, her parents sell her to a rich mestiizo (Spanish) family with the promise of trips back to her family and money; however, neither of these things happen- Virginia is treated like a slave and dreams of a better future. This book is about overcoming and discovering all that you can do. And what makes this book even more powerful is that it is based off of a true story- Maria Virginia Farinango told her story to Laura Resau who molded it into this beautiful novel.